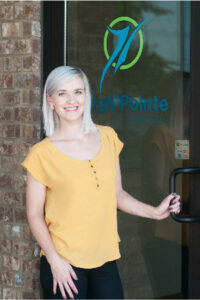 Patient Intake Coordinator ~ You will see Krestina’s smiling face downstairs at the desk of our pediatric clinic. Krestina joined the High Pointe team in 2016 when the company expanded its administrative team in response to the pediatric clinic opening. Krestina handles incoming referrals and will be happy to schedule you (or your child) for the initial visit and ongoing care. You may notice Krestina’s amazing accent – she is originally from Germany though her mother is Russian. Krestina met her soldier Johnnie in Germany while he was stationed there and they have been married almost 5 years. In 2011, they moved from Germany to Clarksville and later had their beautiful daughter, Janae. Janae is 16 months and growing fast! In her spare time, Krestina enjoys spending time with family and hanging out with friends. She also loves DIY projects and creating anything she finds on Pinterest. High Pointe Therapy updated their cover photo. Join our mailing list to receive our monthly newsletter with updates from the clinic and news about upcoming events! Mon-Fri 8 a.m. —5 p.m.